Recommended? : Major YES! Read This! This review is spoiler free. And it wasn’t easy because all I want to do is talk fine details about this story with my two, utmost favorite characters from The Original Sinners series. I am thrilled that Tiffany Reisz wrote more of Griff and Mick…and I definitely plan to return to their world over and over again. Just a great read and one of the best additions to the series so far! Okay, so when Tiffany Reisz put up on her instagram that this book was available on NetGalley, I ran-not-walked over there and picked it up. Again, the subject matter isn’t my cup of tea (or in Norwegian, en kopp te.) But, that’s not why I keep reading anything I can relating to the Original Sinners’ series. It’s the twisted story that has me grabby-hands and wide-eyed for the books. 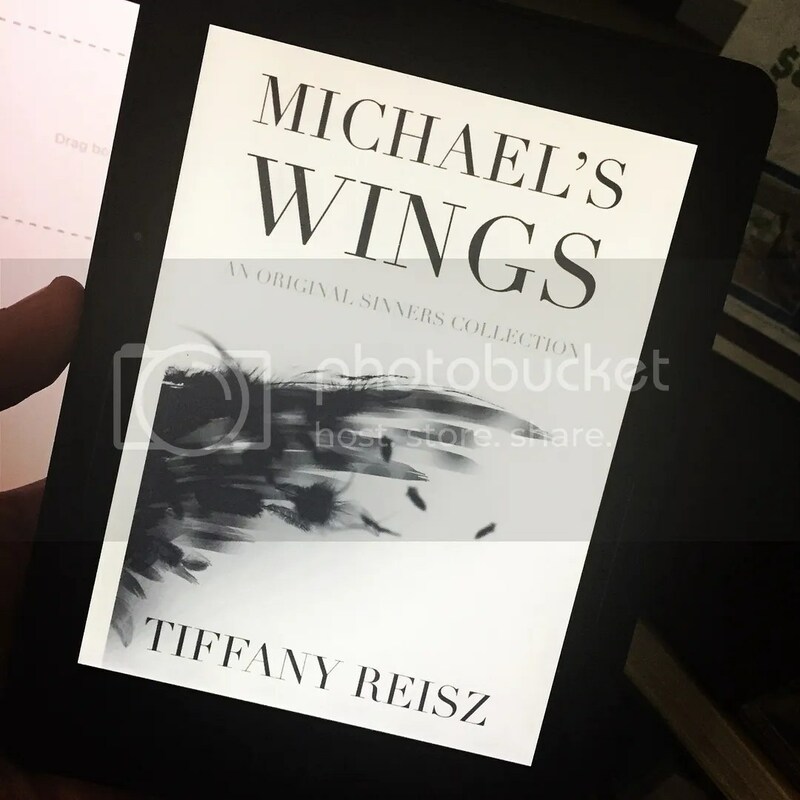 Michael’s Wings is a collection of short stories, featuring Griffin Fiske and Michael (from The Angel). I had only been begging for more of these two for what feels like forever. And this came along, and I am over-the-moon happy! Michael’s Wings ~ The primary story where Michael runs off to Louisana, where King, Søren, and Nora now call home. Griffin asked Michael to marry him (*SQUEAL! *) and now Michael has a few days to ponder his answer. Does he want to marry that spoiled trust-fund-baby dom? Seeing everyone again was great. Nora is ever the same. King and Søren haven’t changed, and if they did, it was for the better… Such a sweet story. And it just made me fall back into old ways where Griff and Mick are concerned. (The thing where I hate to put them down and leave them alone for five seconds. Even snuck in the reading of a single sentence in at work once…) I’m going to leave this story now for fear that I’m going to spoil it because… It was five stars for me. Griffin in Wonderland ~ This goes back in time to when Griffin was twenty-two and realizing he was at rock bottom. This was back when King, Søren and Nora were in NYC and the 8th Circle was in its hey day! Sort of a discovering himself, coming-of-age-tale for Griff. It was where he learned how to be who he is. So interesting to see young Griffin. Five stars. Gauze ~ A flashback to the moment Michael slit his wrists and comparison with why he had gauze on his wrists again. The events happened during The Angel and covers some answers we didn’t have before. It was a sweet moment for one of my favorite characters in this series. Five Stars. The Theory of the Moment ~ So…just after the events of The Angel, Griffin had a talk with Michael’s mom. Just to clear the air about why a much older man was in love with her son and where the future might take them some day. It was enjoyable and gave some insight to the always wild Griffin. Made my heart melt a little. A moment or two, it felt a little repetitive in the ideas being talked about between the two characters, but a great missing piece to the Griff-Mick puzzle. Four and a half stars. The Couch ~ Sort of funny. Sort of Sweet. Sort of: “Oh good lord!” in a blissful way. It was cute and funny and just a moment with these two guys who are stubborn and yet so in love. *happy sigh* Five stars. A Better Distraction ~ This one was another random moment of Griff and Mick’s life. Just a short, sweet, naughty tale that makes you love these two together even more. And also some laughs, thanks to a Titanic moment or two. Tied for ultimate fave story from this book. FIVE STARS! My only complaint about this book is that it was out-of-order, story wise. That being said, it isn’t that much of an issue. Any time I can get a Griff/Mick story, I am a happy girl. This book was pure joy from page flip one to the tear dropping from my eye at the last page flipped on my Kindle screen. Is this review fair? I can’t say. I mean, Tiffany Reisz is not only a great person to “chat” with on Twitter and Insta, but her stories are unique and smart and funny and hella hot and…well, I find it difficult to ever want to put one down, this one being one of the most difficult ones, because I do love those characters so much. I’ve come to know and love them. And just when I thought I couldn’t see them anymore, here is this book of bliss. I HIGHLY REC this book! I would say read The Original Sinners stories before diving in so you get a hint of who is who and why they are. And if you have already read them, do yourself a favor and read this collection of pure happiness! Thanks again for the opportunity to read this. Anytime for you, my Queen, Tiffany Reisz!